I hope you all had a great weekend. My husband made us a new breakfast to try, Bircher Muesli, which I really liked. Anyway on to the books because I went to Half Price Books and found some great books on the clearance shelf. Not new books but vintage books which I can upcycle and turn them into journals. I know for some of you the idea of gutting a book is horrifying but as I’ve said before, I truly believe I’m giving forgotten/discarded books a new life. Granted, if the book is a rare find or something special, I won’t be cutting into it. So on my visit I found three books which are so cool. One is a The Book of Knowledge which is a children’s encyclopedia book. The one I found is book five from the series and the copyright date is 1953. I love some of the pictures in this book even if they are mainly all black and white. The book is in pretty good condition so no plans to make anything with it. At least not yet. 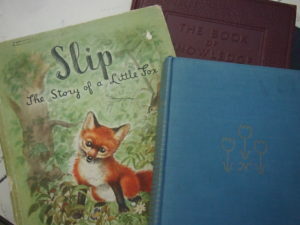 The next book is Slip the Story of a Little Fox by Phoebe Erickson. This one is pretty tattered but I love the illustration of the little fox on the cover and as well as the illustrations inside but what really got me was in the inscription. It was to a granddaughter. The grandmother writes that this had been a favorite of hers as a child and she hoped it would bring her granddaughter a lot of joy. So why is it on the clearance shelf at Half Price Books?! I know, families move, relatives pass away, so many turn of events happen in a lifetime and books and other treasures end up lost but hopefully I can use some of the pages in a recycled book and someone else will get a lot of joy from this. Now the other book I was thrilled to find is The Netherlands from The World in Color series. This is a 1951 edition and from what little I’ve been searching online it looks like there are many other books in this series. I thought oh this would be great to repurpose into a travel journal and honestly didn’t even look much at it other than the cover which has three little tulips embossed into it. Once I got home and really started to page through the book, I discovered it was quite beautiful with gorgeous color illustrations and maps. I mean just look at those end papers! What I would love is to find another copy of this book and turn one into a recycled journal while keeping one intact. 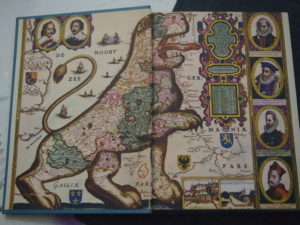 We’ve been to several cities in The Netherlands and would love to go back again so I could just imagine having this book as my travel journal. Wouldn’t that be great? Anyway, now I am going to be on the hunt for some others of these books. We have quite a lot of thrift stores in my area and now I feel like I have to go visit those and see what I find. How about you, do you have vintage books on your shelves? Any particular kind you collect? That is great that you found those older books, Iliana! And your journals are so lovely. You are very talented. I do like vintage books, especially ones that were favorites when I was a kid. I have a couple of shelves of them that I’ve gotten at various places – mysteries and other chapter books that I enjoyed. OMG–that end paper is marvelous! I do have a few vintage books. Sometimes because they remind me of my childhood or my children’s favorite books and sometimes, I want them because they are so beautifully illustrated. One: lots of used and unloved books in thrift shops because they say people are reading less or maybe reading e-books or doing stuff online. Two: journaling on paper. This is very retro! I used to write my thoughts on paper, now put them in my blog with images, share instead of hiding. Others do twitter of course. I think it’s more of a niche activity than maybe in the past. Your use of books for it is neat.